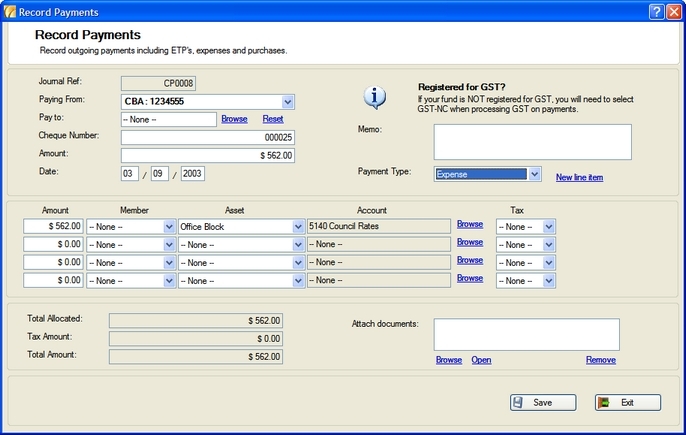 The management of receipts, payments and journals is an important part of managing your SMSF. Of course any accounting package can process these types of transactions; however there are a few differences with self managed superannuation funds. These are just a few items which need a different treatment than what is available in most accounting systems. All transactions recorded in MySF Manager can be tagged against a member or an asset, as well as being posted to a selected account as in a traditional accounting system. This enables MySF Manager to provide users with powerful analysis of asset performance and offer more accurate calculations of member entitlements. Anytime you process a transaction where additional information is needed (such as a dividend, distribution or ETP) MySF Manager will show you the relevant screen where you will be able to enter that information. After you enter the required information MySF Manager will generate and post transaction to record the accounting effects of the event. You may also find that a company pays you distributions throughout the year, but only provides the details of the distribution (and associated tax consequences) at the end of the financial year. In most systems this means that you would need to either refrain from recording the event until possibly months later or process complicated adjustments at the end of the year. MySF Manager solves this problem by enabling you to designate a dividend or distribution for completion at a later date, while still recording the amount of money received or reinvested. When you receive the details of the dividend or distribution you can enter that information into the dividend / distribution completion screen, which will then make the adjustments automatically. Whether you are making a payment or receiving income where GST is charged, GST will be calculated if selected and journals are generated accordingly. You will also be shown the lines of the transaction to confirm processing. Business cards are used to represent individuals and companies that have some connection to the fund. This includes your accountant, tax agent, members, businesses in which you own shares and more. You can add as much or as little detail about an individual or business as you like. 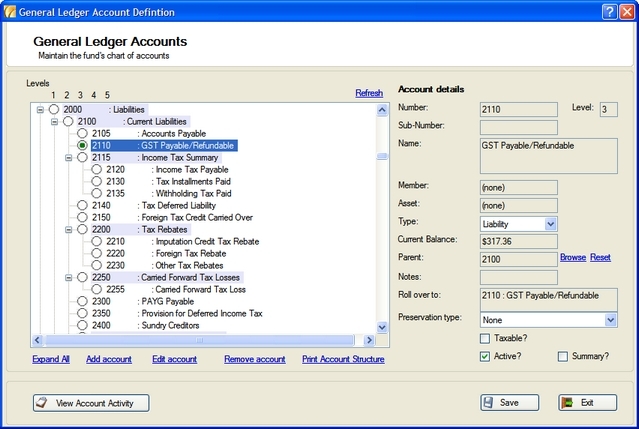 At the heart of any SMSF or accounting system is the general ledger of accounts. This is a hierarchical structure of all accounts in the system. 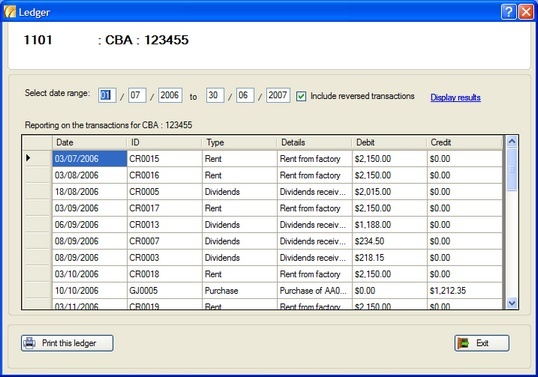 The design of the general ledger and the accounting subsystem in MySF Manager were lead by an FCPA with his own SMSF, assisted by other accountants. This ensured that the system complies with all accounting standards from the very beginning. There are five main types of accounts: asset, liability, equity (member’s accounts in MySF Manager), income and expense. Each top level account has a number of child accounts which may have their own child accounts. The accounts at the bottom of the hierarchy are called ‘detail’ accounts and you may post transactions against them. Accounts which have child accounts are called ‘summary’ accounts and you may not post transactions against them. The general ledger in MySF Manager is up to 5 levels deep and usually contains over 800 accounts depending on the number of assets held, number of members and other fund details. MySF Manager enables you to drill down to a very fine level of detail for events that have been recorded. For example, if you wish to view the activity on any selected account, you can double click on that account in the General Ledger screen and view the ledger window. This shows you all of the details of ever y transaction that have touched the selected account. 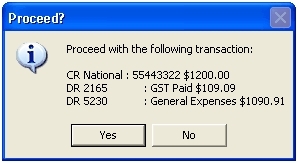 Note that you can also view, edit and reverse transactions that have been processed by going to the Transaction Reporter screen. For more details please see the Reporting and Analysis section of this tour, or download the demo.